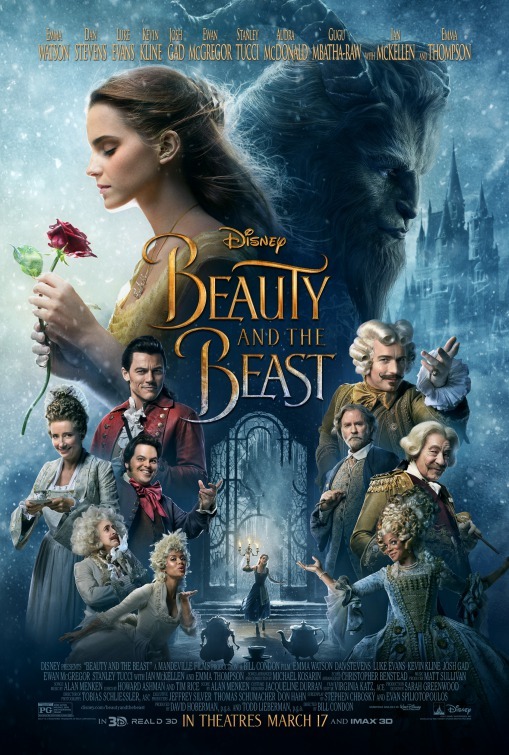 Review: Let’s start with the truth, the whole truth, and nothing but the truth: I had to see this live-action version of Beauty and the Beast twice before I felt I could really give it a fair shake. I had been so looking forward to seeing Disney’s classic tale come to life that I perhaps went in with expectations dialed too high, spending much of the first screening feeling a bit, well, let-down. Not that the production design wasn’t glorious (it is), not that the music wasn’t stirring (Alan Menken’s score still dazzles), and not that the actors giving flesh and bone life to characters crafted in animation studios weren’t up to the task (they are…mostly), but there was something that just didn’t hit my ‘Thrill Me’ button. Seeing it again two weeks later in 3D accompanied by rich Dolby Atmos sound, I found some magic that wasn’t there before…but many of the problems remained. Let’s go back to 1991 when Disney hand-drawn animation reached its full renaissance and true zenith with the release of Beauty and the Beast. A dynamite blockbuster and instant classic, it also became the first animated film to be nominated for Best Picture (other nominees that year? Bugsy, JFK, The Prince of Tides, and the winner The Silence of the Lambs) a title it held for 18 years until the list of nominees was expanded and Pixar’s Up nabbed a nom. Disney recognized it had a property that could have a life beyond the silver screen and soon Beauty and the Beast became a highly popular and endlessly profitable Broadway musical. With countless releases on video, DVD, BluRay and a 2012 re-release in 3D, the film is easily Disney’s bread and butter. It’s no wonder, then, that with the popularity of Disney’s recent slate of live-action adaptations of their classic animated films (Maleficent, Cinderella, The Jungle Book), Beauty and the Beast is swooping back into theaters in a lavish new production. You know the story, right? Snooty, spoiled prince angers old beggar woman that’s really an enchantress in disguise. Prince is turned into a beast and his staff are turned into various objects until the prince/beast learns to love and be loved in return. Enter headstrong and misunderstood Belle who winds up imprisoned by the Beast but warms his cold heart. The rest is fairy tale history. My biggest issue with 2017’s BatB (let’s shorten it, shall we?) is its length. The original film was a solid 84 minutes with very little in the way of excess plot, characters, or showiness but this film is 129 minutes and feels longer than it had to be. That’s due to some baffling additions in plot and characters that feel like distractions from the action instead of support for the story. Take Audra McDonald (Ricki and the Flash) and Stanley Tucci (Spotlight) as the castle entertainment turned into a wardrobe and a cadenza, respectively. McDonald’s character isn’t new but the role is beefed up to ridiculous proportions, seemingly only to have an excuse to showcase McDonald’s glorious soprano. Tucci’s piano man adds nothing to the plot and winds up taking time away from established characters Cogsworth (Sir Ian McKellen, The Wolverine, crazily underused) and Lumiere (Scotsman Ewan McGregor, A Million Ways to Die in the West, nearly nailing a French accent). Emma Thompson’s (Saving Mr. Banks) is no Angela Lansbury but, even though an obvious choice, her warm-hearted Mrs. Potts gets the job done, delivering a sweet interpretation of the title tune. Screenwriter Stephen Chbosky (The Perks of Being a Wallflower) has made the curious decision to provide a backstory for Belle and her father that involves Paris, a windmill, and the Black Plague. While it may give more dimension to the character in general, it takes up too much time and again feels like it was added to introduce one of Menken’s new songs. Ah…the songs. Three songs from original musical written by Menken and the late Howard Ashman were nominated for an Oscar and hearing them again with a full orchestra it’s not hard to see (or hear) why. ‘Belle’ is still an energetic introduction not only to our heroine but to her “poor provincial town” as well. I missed some of the eccentric townsfolk Disney animators dreamed up, they’ve been replaced by bland-ish niceties that strangely seem more sinister than their hand-drawn inspirations ever did. ‘Be Our Guest’ remains the star centerpiece with McGregor and an entire Crate and Barrel’s worth of kitchen fare going Busby Berkley when serving dinner. I’ve heard ‘Beauty and the Beas’t a zillion times in a million different versions but it never fails to choke me up with its grand music but tender lyrics. Surprisingly, the songs Menken and Tim Rice wrote for the Broadway musical are jettisoned for lesser carbon copies. I can’t quite understand why the Beast’s knock-out Act 1 closing number ‘If I Can’t Love Her’ was replaced by ‘Evermore’ which says nearly the exact same thing. So, too, for ‘Days in the Sun’, taking the place of ‘Human Again’ without much justification. The only semi-winner in the bunch is ‘How Can a Moment Last Forever’, sung by Emma Watson and Kevin Kline in the movie and Celine Dion over the closing credits. It’s a clear bid for an Oscar nomination and never count Menken out to sneak in and win the prize. Director Bill Condon (The Twilight Saga: Breaking Dawn – Part 2) has never had the lightest touch and it shows in several frenetically edited numbers that cut away when they should be pulling back and showing the choreography. It’s interesting that the best staged number (‘Be Our Guest’) is the one largely done with CGI and not the otherwise exuberant opening number or villain Gaston’s big boastful number set in a beer hall. I was worried that the enchanted objects would look odd and they most certainly do. It takes a good fifteen minutes to adjust to these computer creations which are blended seamlessly into the live-action pieces. The castle design is gorgeous and the film looks like it spent every nickel of its sizable budget. In the title roles, Dan Stevens (Night at the Museum: Secret of the Tomb) and Emma Watson (Noah) are just dandy but don’t truly possess the ‘It” factor that would make them feel like the only possible choices. Watson’s got a good demeanor and knows exactly who Belle is, but her singing voice is AutoTuned to an almost comical level and I so missed hearing the soaring vocals of Paige O’Hara. Though Stevens feels slightly too old next to Watson (giving further fodder to the whole Stockholm Syndrome debate that’s followed the tale since it’s origins), he manages to create an actual character within the constraints of his motion-captured Beast creation. He’s got a nice singing voice too. The best of the non-professionals is Luke Evans (The Raven) as Gaston. Though he isn’t the ‘size of a barge’ as his character indicates in song, he’s a nicely nasty villain cut-off at the knees by the independent Belle and her protective father (Kevin Kline, The Big Chill). He’s got a rich voice and makes each of his scenes and interactions count, I like that he didn’t try to excuse Gaston’s actions or show any redeeming qualities that might make us feel sorry for him. Then there’s Josh Gad (The Wedding Ringer), an actor I just don’t get. I liked him in Frozen when he was heard and not seen but as Gaston’s sidekick Lefou he’s easily the most grating presence in the film. Condon gives Gad far too much slack to modernize his character through shamelessly mugging while lip-synching terribly and though his affections for Gaston are plain as day, the “exclusive gay moment” being buzzed about is a blink and you’ll miss it beat most won’t even recognize. There’s no doubt this is going to make Disney another trillion dollars at the box office and in clever tie-ins but for me this was the least successful live-action update so far. It wants to have it both ways; being reverential to the original one moment and not quite as precious to it in another. Condon wraps it up with a terrible final edit that only made me angrier the second time I saw it. Rated PG, it rides the line of being too long for little kids and pretty scary when you throw in two fairly terrifying wolf attacks. It’s much darker than the animated film so parents should think twice before taking the tots to this – popping in the original would be my suggestion.